To touch on an appearance milestone, Paul Burns playing for Queens two weekends ago was his 250th first team game for the club. Burns is another in a long line of players to turn out for Queens having been born in Ayrshire. In Burns’ case it was in Irvine and he is by no means the only player for Queens to hail from that town. George Hamilton was born in Irvine in 1917 before going on to play for Queens and then later for Scotland. More recently Derek Frye and Craig Samson are ex QoS players from Irvine. Today, Burns isn’t even the only Irvine born player in the first team squad – Craig Reid is another. While born in Irvine, however, Burns was raised in Cumnock. 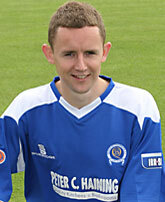 Burns’ debut for Queens’ first team was a league game on 18th March 2003. Queens won the game against Arbroath 3-0 at Palmerston. He joined the fray as an 84th minute sub for Eric Paton. His first goal was early the season after when he hit the second in a second round League Cup 3-0 win away against Ross County. The other two goals came from Alex Burke. Burns first League strike was on 2nd October 2004 when scoring the opener against St Mirren at Palmerston. David McNiven scored the second QoS counter in a 2-1 win. On 16th Feb 2008 Paul Burns scored a double for Queens in a 3-1 win at home against Stirling Albion (Jim Thomson scored Queens’ third). Burns first Queens goal in the Scottish Cup was in 2007/08 when Queens won against today’s opponents, Peterhead. It was in that season’s Scottish Cup that Burns had what can be strongly debated as his most famous moment to date. The half time score of Queens semi final tie against Aberdeen at Hampden Park was 1-1 with Stevie Tosh having opened the scoring for Queens. Four minutes into the second half big Sean O’Connor’s clever dummy let the ball run on to John Stewart allowing the pacy forward to out speed the defenders of his former club. Stewart squared to give Burns a shooting opportunity. Unable to get a shot in cleanly with his favoured right foot, the ball fell to give Burns a second opportunity this time with his left. 2-1 to Queens as Burns swung the ball into the top corner of the net to secure his place in Queens history. 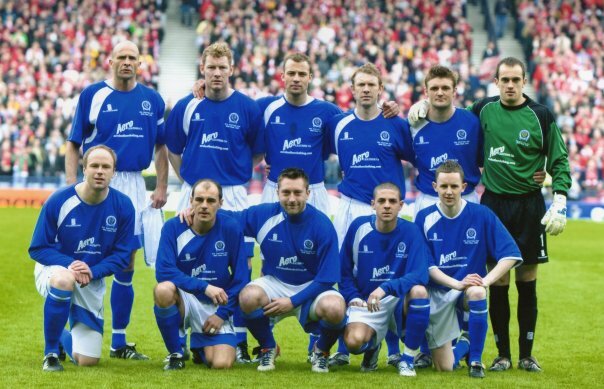 O’Connor and Stewart each themselves got on to the score sheet giving Queens their most famous win in decades – a 4-3 victory to earn a cup final place at Hampden. This was Burns’ first game after a 90th minute sending off against Livi in the league. Burns then played in the Cup Final against Rangers and in both Queens’ UEFA Cup ties against Danish outfit FC Nordsjælland. On 26 Sep 2009 Burns hit another double, this time in a 4-1 league win away to Dunfermline (Wyness and Holmes also scored) before this season he scored his first senior career hat trick in the 5-0 win against East Fife at Palmerston in the Challenge Cup. His 250th appearance was on September 25th in the 0-0 draw away at Stirling. This was followed by an 88th minute sending off in his 251st game last Saturday.